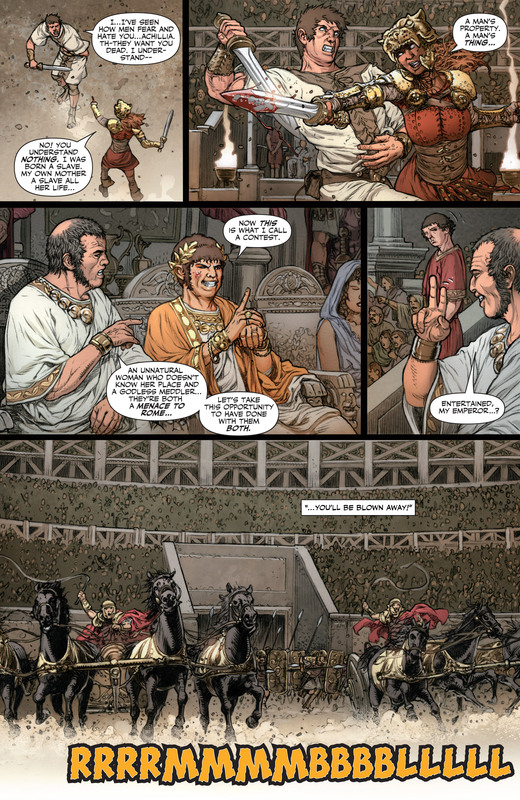 scans_daily | Antonius Axia was investigating the troubles plaguing Rome. He met her beneath where she'd fought, after her fight.
" 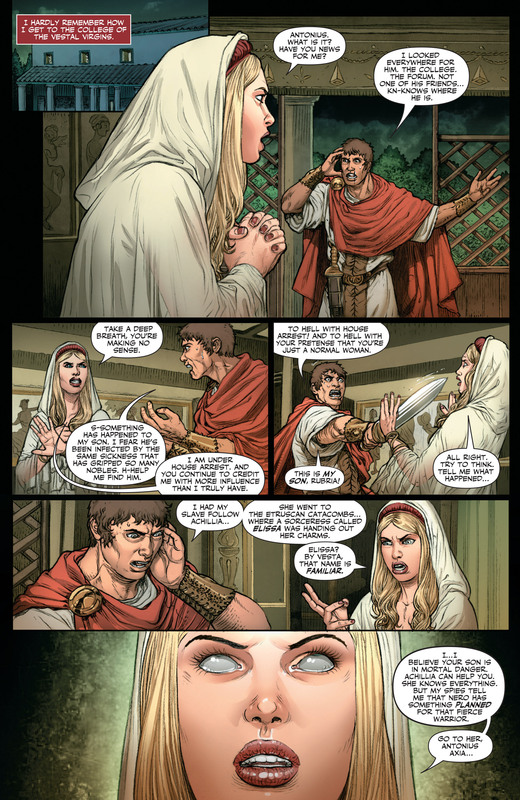 Achillia, I am Antonius Axia and I wish to- "
She had nothing to say to him- she angrily denied that she knew nothing of " any curse " afflicting Rome. The manager of the arena was no more willing to let Antonius question her. They tracked down the troupe of gladiators Achillia came from.
" What ill has she done you, fellow? " " She's made my life a misery, is what. My wife thinks she's my equal since Achillia started killing all those men. " That night, in the catacombs, Achillia met Elissa. The slave-turned-purveyor-of-charms-to-the-wronged received her brusquely. 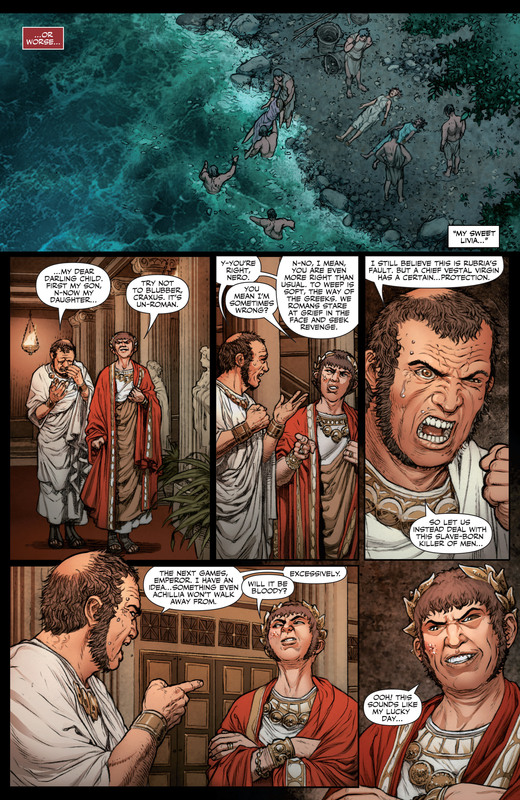 The next day, Antonius was summoned by the emperor Nero, who demanded an update on his investigations. 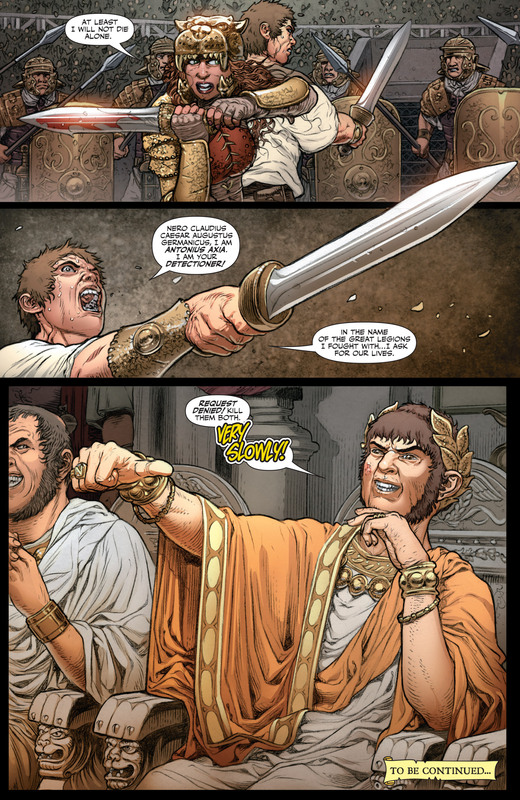 Told that nothing new had been discovered, Nero threatened Antonius with being fed to the lions.
" I might even put that son of yours in the arena with you! " 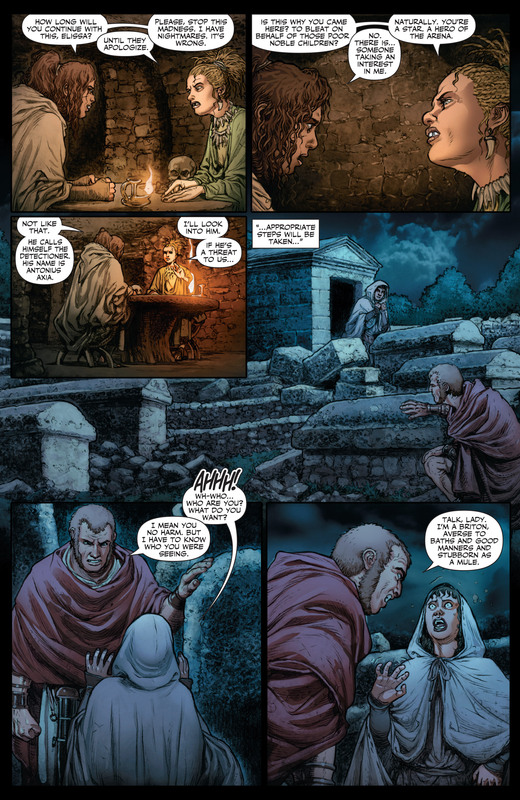 Antonius returned home that night to find his son missing. Bran, who'd just come back from trailing Achillia as Antonius'd told him to, said his son'd been seen leaving that evening as if in a trance.
" .. Go to Achillia.. "
He met her again in the arena, as she won the next-to-last victory for her freedom. He came, sword drawn and down, asking for her help. 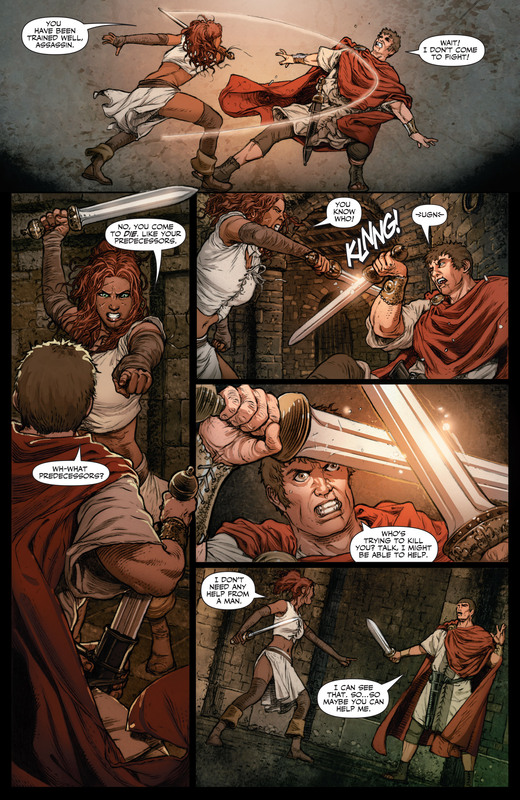 He blocked her sword and took her fist.
" The Praetorian Guard! " members of the audience cried.
" The Emperor's finest soldiers! " " And so it ends.
" In my heart I knew they would never allow me my freedom. " 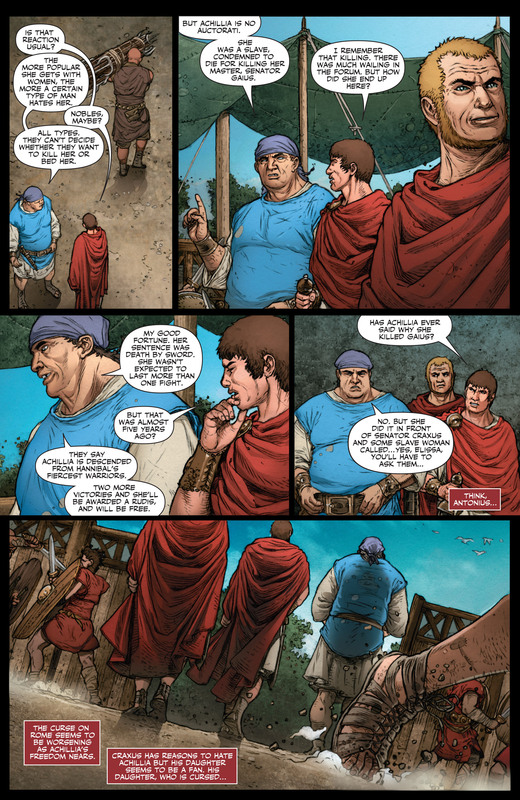 (This's 7 of 22 pages from last month's Britannia: We Who Are About To Die #2. #3 came out this week. So weird to see my name pop up in a story. Rarely see the name Elissa show up anywhere.